Mike Trout is a good reason to van it down to Arizona. Before he got busy signing the richest contract in American sports history, I made it my business, on behalf of the good readers of WPW, to go get a locker tour from Mike at Spring Training. We’ll have that out soon, but we can still gawk at some photos in the meantime. 12 years, $426,500,000. 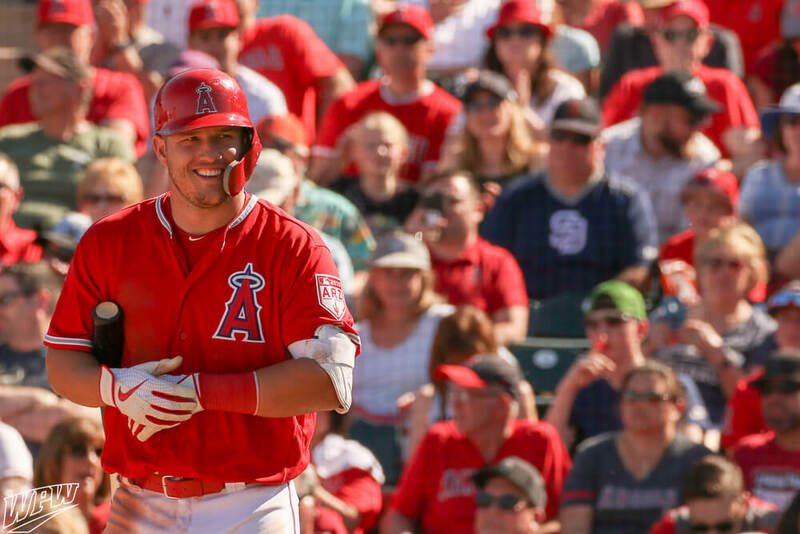 In the same way that A-Rod’s 2001 deal was a gigantic leap forward in athlete earning potential, Mike Trout’s 2019 deal will be the new gold standard for American athletes for a long time. Just another reason to play baseball: 16 of the 20 highest paid American athletes ever play(ed) baseball. He’s also got some cool batting gloves for thumbin’ through all that dough (and hitting heat-seeking missiles). They’re pretty similar to the Nike Force Elite style available on Eastbay with personal touches. Trout was also wearing a white-out version of the latest Evoshield PRO SRZ guards, which will be available on Evoshield very soon. Trout wore his Trout 5 cleats in his favorite white and red colorway, with the “856” area code on the pull-loop. While the Force Zoom Trout 5 is the material-equivalent of Mike Trout’s 2019 cleats, the closest aesthetic match is the cheaper Force Zoom Trout 5 PRO, available here. Why they’d make the names so similar is confusing, but the materials are clearly different. One of the reasons for optimism in Anaheim, Jo Adell walked off in adidas Pro BOUNCE basketball shoes, which seem like the type of shoes that you’d wear to the club if you lived on the moon. Not saying that’s a bad thing at all. Kinda love ’em. Not only do Trout and Bourjos rock the Trap web, but prospect Torii Hunter, Jr. is also rocking one just like his pops aka Spidey. Rawlings offers a few Trap webs at varying prices on their website, Just Ballgloves, and Baseball Express has one. Andrelton Simmons is breaking in a navy and red Mizuno, which is just about the flashiest Mizuno glove you’ll ever see. Its the Mizuno GMP400 Pro Deep III web that he’s been winning Gold Gloves with since his Atlanta days. The closest alternative is an all-black version available at Baseball Express. Simmons got a few push-ups in after a hard slide at second. One thing I’ve noticed watching Simmons for a few seasons… he doesn’t particularly care for hard slides. If anybody knows what those MLB band-aid looking things are, please comment below. (Update: @sdgloves on IG helped us out here.) Its called Rocktape, and it “microscopically lifts the skin away from the muscle and fascia below, creating a decompressive effect.” Claims to speed up recovery and delay fatigue. Available for limited teams here. Need ’em for boo-boos.